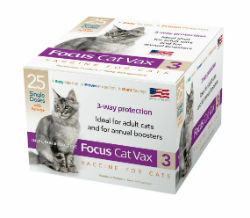 For the vaccination of healthy cats 8 weeks of age or older as an aid in the prevention of disease.Each of the viruses are widespread and are common disease causing agents in cats. Injectable for easy administration. Meets or exceeds all USDA standards. F9 Calici Antigen for superior protection. MLV fractions for rapid immunity. First shots & boosters for the health of kittens & cats. The dosage is 1mL injected subcutaneously using aseptic technique. Open syringe by twisting or tapping the cap against a hard surface to break the heat weld. Prepare the vaccine by injecting the diluent into the vial containing the desiccated vaccine cake. Shake well. Withdraw entire contents into the syringe. Subcutaneous administration: Lift the loose skin behind the neck or behind the right hind leg and insert needle. Inject entire contents of syringe. Do not inject directly into blood vessel. IMPORTANT NOTE: Before injecting vaccine pull back slightly on syringe plunger. If blood enters the syringe freely, choose another injection site. vaccinate kittens at 8 weeks of age or older. Administer a second 1mL dose 3-4 weeks later. Annual revaccination is recommended. Due to maternal antibodies in kittens, repeated vaccinations are recommended until 12 weeks of age.